Since the team was formed in 2005, CU teams have competed in almost 2450 games and have won several tournaments, including three State Championships. CU alumni have gone on to play ultimate at colleges such as: Clemson, Harvard, Yale, Carleton, Elon, Stonehill, Rhode Island, Clark, Kenyon, Villanova, Colorado College, Lafayette, Vermont Maine, and many more. We have had a large number of players participate in the Portland Summer League. Some of our players have competed on the New England Youth Club Championship (YCC) team and traveled to Minnesota to represent New England in that event. It is very satisfying to watch these athletes fall in love with ultimate and continue to play beyond High School. This is largely due to the positive experiences of the players, their friends and parents, while playing High School ultimate. There has been a rapid growth of the sport nationally at the High School level, and we are experiencing it locally as well. 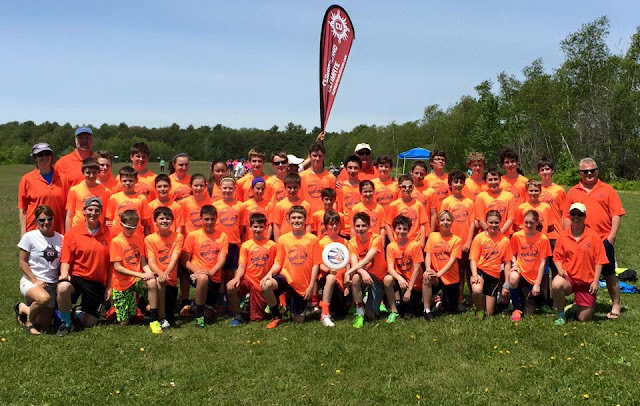 This growth is evidenced by the establishment of the Maine High School Ultimate League. This year, 2014, will mark the Fifth year of the league. Twenty or more local High Schools will participate in the league. These league games will be played at the Cumberland Fairgrounds on Wednesdays at 3:30pm and at 5pm for 8 weeks starting on April 2th. CU has contributed to the growth of the sport by hosting the Cumberland Invitational over the past Six years and inviting a number of teams from outside the state. The tournament was very well received and allowed many local teams to increase the number of quality games on their spring schedule.